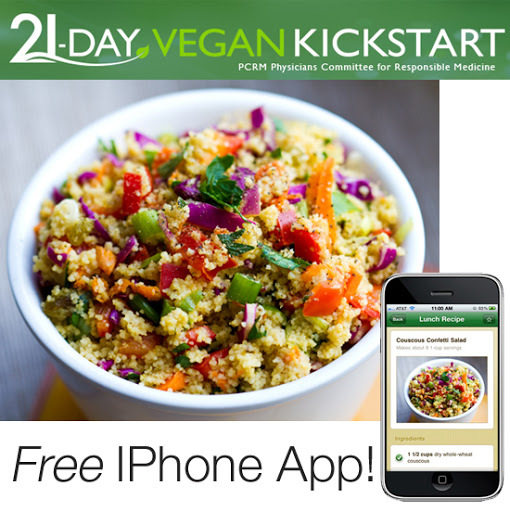 Vegan Kickstart IPhone App by PCRM. Photos by me! I'm a huge fan of PCRM's Vegan Kickstart program. It's free. It's fun. And it is for anyone who is curious about a vegan lifestyle, is already vegan or even anyone who simply wants to get healthy by going vegan for 21 days (or more). And now taking the Vegan Kickstart challenge is easier (if you have an IPhone!).. IPhone App Photos By Me! I was super excited when PCRM asked me to shoot the photos for their App. I received ten of PCRM's kickstart recipes to prepare in my studio/kitchen and photograph! That's a whole lot of vegan yumminess for one NYC kitchen. I am thrilled to see my photos in action! *note: you can still join in the Vegan Kickstart even if you do not have an IPhone! "The Kickstart app includes all of the recipes in the Kickstart, many of which include mouthwatering step-by-step photos, as well as daily tips. The app can be used as a companion to the online 21-Day Vegan Kickstart. The app is meant to be downloaded at any time and does not necessarily correspond with the online Kickstart schedule..."
You can learn more about the App and Download it here on PCRM's website. ...did I mention the App is FREE?! Vegan IPhone Apps are great! My Vegan Smoothies App is here - and I'm working on a new App for the fall season. And PCRM's App is AWESOME! Kickstart App Review. Since I first-hand made/tasted ten of the PCRM Vegan Kickstart App recipes, I want to share with you what I thought about them! Cooking: Easy to make! The hardest part is prepping/chopping the veggies! Perfect for a light lunch or dinner side. Colorful! Makes a beautiful salad to present on a table. Tasting: Delicious! Light, fluffy, zesty, crunchy veggies in every bite! Cooking: So easy! And what a creative recipe with veggie juice and frozen apple juice concentrate! Tasting: Zesty, bold BBQ sauce flavor! And so healthy! 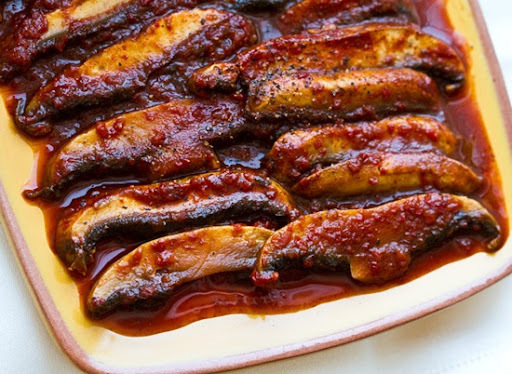 Bring this to a community BBQ and those meaty mushrooms will beat and non-vegan BBQ sauce on the picnic table. Add extra chili powder for extra heat! Cooking: So so easy. Simply prep, toss and serve. Tasting: I cannot tell you enough good things about this salad. I was chowing down through the whole photo shoot! I couldn't stop eating it! 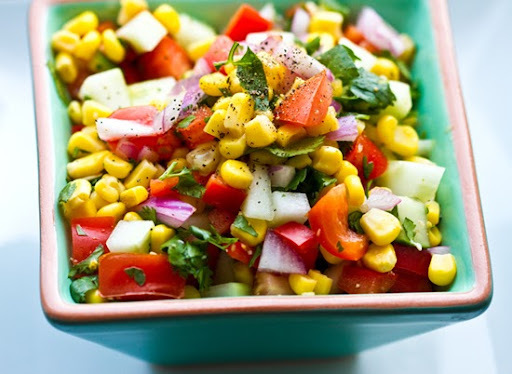 The zesty combo of coriander, cumin, cilantro, rice vinegar and cider vinegar with the sweet corn was amazing. I have already made this again and again. LOVE it. Cooking: Easy! Follow my quinoa cooking tips if you need help with quinoa "fluffiness". Tasting: Light, simple and flavorful. Perfect sub for the oh-so-80's "rice pilaf". Cooking: Easy and very healthy. Perfect brunch fare. It's more of a saute mixture than a true "scramble" But if you want it more scrambled simple give the tofu a few extra chops. Tasting: I have to be honest I was a bit worried that this wouldn't taste so great because the ingredients are SO healthy! The tofu is basically cooked in water and there is no added oil! But guess what, I loved it! The spices and veggies add plenty of flavor. Tasting: Love the simple zesty flavor of this soup. I will make this for lunch again. Super light and feel-good flavors. 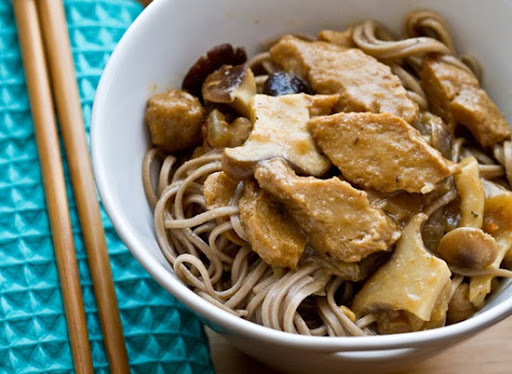 Cooking: The noodles and seitan are a bit more advanced, but really the recipe is so easy any newbie vegan can make this. Tasting: Perfect dinner meal. Protein, healthy buckwheat noodles and plenty of savory flavor in this awesome recipe. Cooking: So many ingredients! But it was so easy to make! Make a bit pot of this and eat it all week. Tasting: Complex flavors of tomato, artichoke and lentil - delicious. Colder days are coming - have this recipe handy. Cooking: I rarely boil my yams - but I loved this method of prep! I was worried they would lose flavor (I usually bake or roast my yams) But they didn't! Healthy way to prepare yams. Tasting: Sweet potatoes/yams are a fave food of mine. So yes, I loved this recipe. Add a bit more Thai paste for zippier flavor. 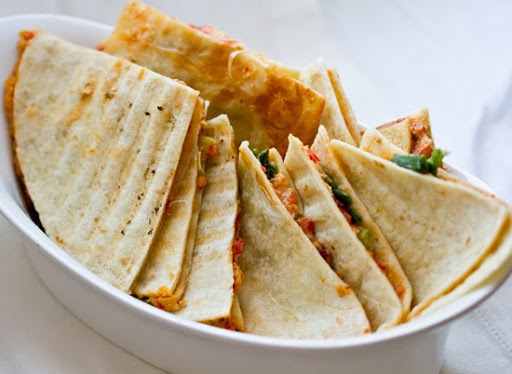 Cooking: A few steps to these quesadillas - but if you have the prep time, the end result is soo worth it! Tasting: LOVED these. No cheese. No sour cream. No guac. Just delicious bean-y flavor! really, this recipe is perfect for teens, kids and anyone who loves a nice quesadilla once in a while. And these are vegan and healthy! Remember: the App is FREE! Pass this post onto a non-vegan friend and maybe you will perk their curiosity! ps - Thanks PCRM for choosing me to shoot the photos! So much yummy vegan fun.